Whilst we think it’s great to be able to customise your item for your home to ensure the perfect fit, we do recognise it can be quite daunting too. We want you to be delighted with your choices so we've put together a W&H customisation guide to help you. Of course, alongside this guide our knowledgeable team are always on hand and happy to help you further so do get in contact if you have any questions. Whether you’re looking for something more traditional or more contemporary, at Willow & Hall we’ve got a great selection so you can easily find the perfect style to suit your home. The ideal style should look great in your home, suit your lifestyle and family needs and also tick the boring but practical ‘it fits’ box. For more help on ensuring the item fits take a peek at our handy Dimensions & Delivery Guide. We have over 240 fabrics available on each and every one of our designs. To make it easy peasy(ish! ), our designers have curated three beautiful collections to help you decide what's right for you and your home. To view all our fabrics and order your favourites, have a peek at our Free Samples page, or even better, once you’ve chosen the design you like, use our style creator – click into the page of the style you love and then select a fabric to see what it looks like in your chosen material. Don’t forget as well, if you’re not wild with excitement about any of our fabrics then not to worry, we can always make your item in your own fabric for you. Just give our team a call and we’ll happily let you know how this works. For more help on our collections and fabrics, washing instructions and on using your own fabric, take a peek at our handy Fabric Guide. Choosing the right seat cushion fillings on your item is super important to ensure you get the comfort and maintenance that is perfect for you. We offer 3 types, all of which offer different squish and shake factors and will change the seat height very slightly depending on your choice. Provides a very supportive and relatively firm sit, keeps its shape really well and requires very little maintenance – just a simple turn of the cushions every 2-3 months. Seats with this filling are smarter in appearance to those with softer fillings and look particularly top-notch on more contemporary and slick styles. Fibres are sewn into individual channels within the cushion. The channels are like in a duvet, they stop the fibre all going into one place and the fibre is silicone treated to stop it from gathering and to keep it supple. This filling gives a slightly softer sit and a more relaxed look than reflex foam however will need a little more love - a quick plump-up after use and a real shake down once a month. High quality reflex foam wrapped in Grade A Duck Feathers sewn into individual channels within the cushion to stop the feathers all going into one place. This filling gives a really snug fit but like our siliconized hollow fibre requires a quick plump after use to keep its shape and comfort. Don’t forget, whatever you plump for (sorry we couldn’t resist), when your item first arrives your seat cushions may feel a little firmer than expected. This is because they’re brand spanking new. Get cosy on them and after a few weeks of use they’ll relax and feel just right. 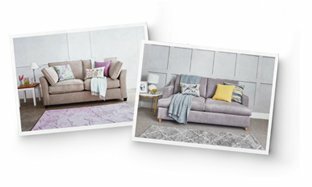 If you’re ordering one of our sofa beds, as well as considering the steps above it’s really important to think about which mattress you want. Two people will be sleeping on the mattress regularly – as mentioned, each of these springs work independently, meaning as well as sleeping in absolute comfort you shouldn't be woken by a wriggling partner! Just want an occasional sofa bed? Remember, if you're looking for something for guests or yourself to sleep on only occasionally, you might want to consider our Appley which comes as a 1, 2 or 3 seater. Easy to use and a real space saver with no arms, it's a really popular choice amongst our customers looking for something to use less regularly but who still want a great night's sleep. Why not put some finishing touches on your beautifully customised item? You can order these to match your item. They're the perfect armour for the popular arm spillage zone and can be conveniently removed for cleaning. We offer nifty removable arms on most of our styles to help with delivery through tight passageways into your room of choice. If you think you might need these then take a peek at our handy Dimensions & Delivery Guide Guide to read about minimum door widths and how removable arms can help. In addition, it might be worth considering our armless designs which don't have this challenge or our modular designs where each module is delivered separately. Perhaps order some extra scatter cushions in matching or contrasting colours and fabrics? Our interior designers tell us it's the perfect way to instantly change the look of your item without having to buy a new one! Feet, whilst appearing a small detail, actually play a leading role in finishing off the look so we try and encourage our customers to order those which come with the style. If however you truly prefer other feet we offer then please do give our team a call or drop us an email and we'd be happy to discuss your options for swapping them. We've collaborated with the luxury British bed linen brand Tonder & Tonder to design an exclusive range of Willow & Hall fitted sofa bed sheets. Handmade in England from 100% cotton and with a 200 thread count, our sofa bed sheets are luxurious whilst also being incredibly practical, fitting perfectly around your selected sofa bed mattress. We offer fabrics with built in stain protection or FibreGuard stain guard. Pen, coffee, mud, red wine and so forth, all common household stains are easily removed by a simple dab of water on the offending party. Read more about FibreGuard and our in-built stain protection here. In addition to the above, we offer Staingard Protection. This covers your item for 5 years against accidental spills, stains, marks and damage such as wine spillages, tea disasters, tears, pet scratches and much more. Read more about Staingard here. We offer removable cushion covers on nearly all our styles meaning if you do get a pesky spillage you can simply remove the offending cushion cover and wash or clean. You can read more about how to clean our fabrics in our Fabric Guide here. All our fabrics are available by the metre for co-ordinating upholstery projects such as cushions and footstools. Just give our team a bell and let them know how many metres you require and we'll let you know how much this will cost direct from the mill.